The racing car in the background was made by Hasan at a Home Depot Workshop! Once again it's time for The Secret Recipe Club. This month I was assigned Burnt Apple written by Traci. Traci describes herself as a "master recipe manipulator"...she can make any recipe healthier and still taste great...I love the sound of that! After browsing Traci's blog I decided to make her Vegan Cheese Crackers. Crackers are always a hit with my boys. These crackers use nutritional yeast which I've always been curious about. I had used it in a mac and cheese recipe before but wasn't impressed with the results. But the nutritional yeast works much better in these crackers. Traci says that these are just like Cheez-Its and Goldfish Crackers. I didn't think they tasted like Goldfish Crackers and I've never had Cheez-Its before...not sure it we even get them in Canada...But these were definitely a great cheezy cracker. They boys enjoyed them and loved how they were different shapes. Thank you Traci for sharing this recipe! In a food processor add all-purpose flour, nutritional yeast, onion powder, turmeric, salt and black pepper. Process till combined. Add the margarine and pulse until dough is crumbly. With the food processor running slowly add the water through the feed tube just until combined. Divide dough into 2 pieces. On a lightly floured surface roll out one piece of dough to 1/8 inch thick and cut out shapes. Re-roll any scrapes to make more shapes. Place shapes on prepared baking sheet and bake 8-10 minutes or until golden. While baking repeat with second piece of dough. These look like great little snacks! I have never heard of nutritional yeast, what is it? Happy SRC reveal! Thanks Jenn! I don't know how nutritional yeast is made but it is flaky and gives a cheesy taste to things. It has vitamin B in it as well. I found it at Bulk Barn next to the regular yeast. My kids would love these! Have pinned ready to try soon. Great pick for SRC! I've never used nutritional yeast before; I've only heard of it. Does it work like regular yeast? Nutritional yeast is not like regular yeast...it doesn't make things rise. It's flaky and gives a fake cheese taste. It has vitamin B in it. The Home Depot workshops are awesome. They are free! Here they are offered the second Saturday on every month. They give all the pieces cut up and you just have to nail, screw and glue. Then apply the stickers. They even give a little Home Depot apron and you get a pin for each project you complete. They have them in the States too. The minimum age to attend is 4 (might be different in the States) When Zunoon get a little older you should definitely take him. Lowes has them too but we haven't gone there...not a fan of Lowes after the whole American Muslim TV show controversy. 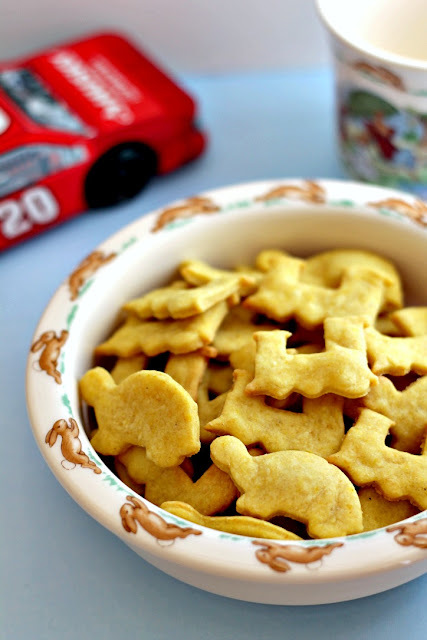 Ooh I made cheezy crackers for a SRC post a few months back but would love to try these vegan ones - great pic! Oh cheese crackers certainly have a place in my heart. Happy Reveal Day! I've been looking for other ways to use my nutritional yeast - these will be perfect! I like it in vegetarian gravy, too (as opposed to mushroom gravy). Really cute crackers. I'm sure they must be delicious too. Great recipe. Love cheese crackers and I love the cute shapes you have! Great SRC pick! These are adorable. I've always been curious about nutritional yeast too. May have to give it a try and make these! lovely cute littel bites !! very very cute... Feel free to pop in to my space too when you get the time. Just jotted some tips on"sane motherhood" on my "pick quicks" blog. Lets staty connected beyond the kitchen as well...Hope you will be a follower there.have a great day !